Ube Halaya is a type of Philippine dessert made out of purple yam mixed with milk,and a key ingredient of Halo-halo but also can be consumed on its own. For those who haven’t seen a purple yam or does not know what a purple yam is, it is a type of root vegetable that is similar to taro or sweet potatoes but purple in color. 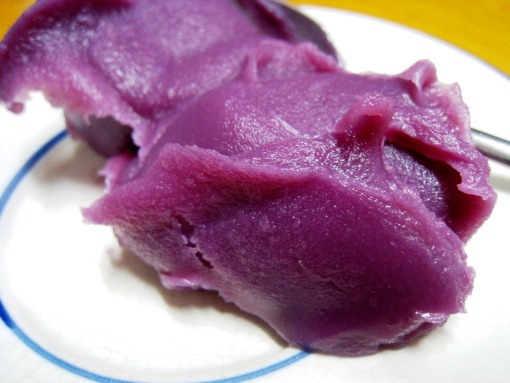 The variety of the purple yam found in the Philippines has been perceived as possessing more delectable flavor compared to other kinds found in other parts of the world. The better kind of ube is found in the cool mountain areas of Baguio that weighs to as much as six kilograms or more a piece. 5. Add the 1 kilo grated ube yam. Adjust the heat to low. 6. Keep on mixing the ingredients for about 30 minutes or until sticky and a bit dry (but still moist). 7. Add the evaporated milk and continue to mix for another 15 minutes. 8. Let cool and place on a large platter. 9. Refrigerate before serving the halayang ube.